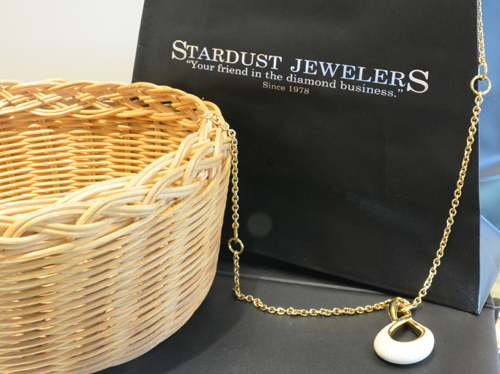 Since 1978, Stardust Jewelers has been a trusted family jeweler providing high quality products and services to their customers. Located in Mendon, Massachusetts, Stardust Jewelers proudly serves the residents of Mendon, Milford, Hopedale, Bellingham, Franklin, Uxbridge, Blackstone, Northbride, Sutton, Douglas, Upton, Holliston, Hopkinton, Westboro, Grafton, Millbury, and other surrounding towns in Worcester County. With seventeen showcases filled with sparkling and desirable pieces set in precious metals and beautiful Diamonds and Gemstones, Stardust makes it easy to find the perfect gift for that special someone. Along with a wide variety of high quality and precious jewelry, Stardust Jewelers of Mendon also provides other services including custom design, buying gold, jewelry repair, and more. Weddings are a time of great excitement, happiness, and joy. Stardust Jewelers understands that your wedding is one of the biggest and most important days of your life. As the local jeweler of choice, Stardust provides its customers with careful and quality service to ensure they have everything they need in place for their big day. Stardust Jewelers takes great pride in helping couples find the perfect engagement rings and wedding bands for their special day. Specializing in Diamonds, Engagement Rings, Wedding Bands, Custom Designing, and Fine Jewelry, Stardust helps you find the perfect jewelry that is right for you, leaving you completely worry-free. The Bridal Collections at Stardust are diverse and unique, matching any style and budget. Choose from custom CAD designer pieces from the number one supplier of fine jewelry, diamonds, and gemstones, Stuller. Stardust also holds an upscale and delicate bridal collection from Valina. This collection ranges in styles from traditional, modern, vintage, and more. If you have an image in your head of the perfect wedding ring or jewelry piece, the experienced and knowledgeable staff at Stardust can transform that idea into a reality with their custom design center. Using a 3D imaging center, Stardust Jewelers can create, re-invent, re-design, update, or personalize any jewelry piece through a step by step process. The entire design process is transparent and visual, allowing you to make any adjustments or changes before finalizing your order. The expert staff will also help you along the way, offering innovative suggestions , creativity, and technical advice so that the final results will match the customer’s needs and desires while providing the highest quality piece of jewelry. Not only is quality one of the top priorities for Stardust Jewelers, but the comfort and satisfaction of every client is their main goal. Stardust understands that jewelry can be a significant, sensitive, and sentimental subject. Stardust Jewelers is dedicated to treating every piece and every client with the respect and care they deserve. For more information about their products and services, contact Stardust Jewelers of Mendon today by visiting their website: http://www.stardustmendon.com or giving them a call at 508-478-2312.